Who needs salt when you have electricity? That’s the proposition of the “electric flavoring fork” created by a researcher in Japan to make meals more palatable for people who need to stick to low-salt or no-salt diets. 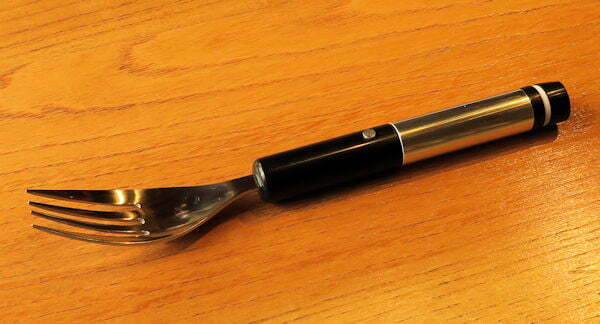 The prototype fork, developed by Hiromi Nakamura of Rekimoto Lab at the University of Tokyo, comprises a handle that houses a rechargeable battery and electric circuit, according to Nikkei Technology. When a user places the head of the fork on their tongue, they can press a button on the handle to deliver one of three levels of electric current, which replicates varying degrees of saltiness. Spices like pepper and garlic help the fork to deliver saltiness rather than sour and metallic tastes, according to Nikkei Technology. The prototype fork, which is not waterproof, was created for less than $18, not accounting for the cost of the fork. The device’s rechargeable battery lasts six hours per charge. This isn’t the first time Nakamura has shown how electricity can simulate saltiness and sweetness: In 2012, she showed off the application of electricity to affect tastes at the Computer Human Interaction Conference in Austin, Texas, and brought an earlier version of the “electric flavoring fork” there. The latest iteration is less unwieldy than a prototype shown earlier this year and is the result of six years of development. Qiantu K50 is a Chinese electric sports car that’s coming to the U.S. The Qiantu K50 is a Chinese electric sports car that will be marketed in the United States by California-based Mullen Technologies. The carbon-fiber bodied, 402-horsepower K50 is expected to go on sale in 2020. Unveiled ahead of the 2019 New York Auto Show, the Genesis Mint concept is a future electric city car with scissor doors in place of a traditional hatchback. Genesis likely won't put it into production, however.